Market life is increasingly conducted in the shadow of global events like 9/11, the Sub-Prime crisis and Brexit. Within International political economy (IPE) two broad positions can be discerned: either the event is ‘just an event’, a superficial spectacle in an otherwise straightforward story of power and hierarchy; or the event is large enough to be considered a ‘crisis’. While sympathetic to such arguments, this book develops a more performative politics of the global event, arguing that the very idea of the event must be placed in question. How is the event constructed? How are market subjects performed in relation to the event? 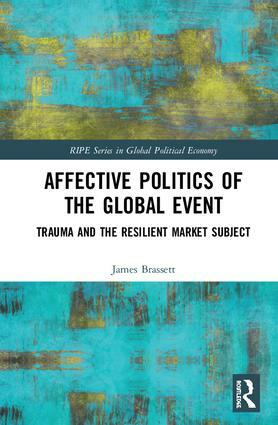 This book argues that emotional and psychological discourses of ‘trauma’ and ‘resilience’ provide an important affective register for understanding how the global event is ‘known’, how it is governed, and how the affective dimensions of market life might be lived. By identifying the contingent rise of these discourses, the author de-stabilises and re-politicises the apparent existential veracity of the global event. The critical possibilities and limits of the affective turn in market life can then be rendered according to classic questions of IPE: who wins, who loses, and how might it be changed? An important work for advanced scholars and students of international political economy, ‘everyday and cultural political economy’, crisis and resilience, as well as broader debates on globalisation. Preface: how does a global market come to life? 4. Trauma and the Sub-Prime Crisis: Governing the Financial Event? Dr James Brassett is Reader in International Political Economy (IPE) and Director of the MA IPE for PAIS. He was previously RCUK Research Fellow in the ESRC Centre for the Study of Globalisation and Regionalisation (CSGR). Brassett works on the politics of globalisation with a focus on questions of ethics, governance, crisis, and resistance. His first book is entitled Cosmopolitanism and Global Financial Reform: A Pragmatic Approach to the Tobin Tax (Routledge, 2010; Paperback, 2013) and he is Editor of seven Journal Special Issues on subjects including 'Ethics and World Politics', 'The Political Economy of the Sub-Prime Crisis', 'The Politics of Legitimate Global Governance', and 'Security and the Politics of Resilience'. Brassett has authored or co-authored some fifty articles and book chapters.